Head over the border this Saturday for one of the biggest Halloween street parties in Australia—Boogong. Photo: Googong website. Discover your inner ghoul and celebrate Halloween this weekend at Boogong – a massive Halloween street party over the border in Googong – or at the Canberra Zombie Walk in the city. If you are after something more cultural, the Canberra International Film Festival is on all weekend at the National Film and Sound Archive, the Canberra Nara Candle Festival will be lighting up Lennox Gardens this Saturday night, the National Gallery is hosting a California Cool film marathon this Sunday, and also this Sunday, the National Portrait Gallery is celebrating children’s week and spring at its Sand and Sky Festival. The Canberra International Film Festival returns this weekend to the Arc Cinema in its latest incarnation as a retrospective film festival, and this year it will be a three-day rather than 10-day event. The Festival is hoping to expand again to a 10-day event next year. It seems that the Festival is working with what resources it has to produce something that is distinctly local in the crowded film festival space. And hosting a film festival in the National Film and Sound Archive, screening celebrated and neglected films from the past as well as contemporary films that investigate cinema history is a good fit. The program features two contemporary films about cinema history—Cinema: A Public Affair, a documentary by Russian-German director, Tatania Brandrup, about the progressive depredations inflicted on the world-renowned Moscow Film Museum by a succession of Russian bureaucracies; and Searching for Ingmar Bergman, a memoir by Margarethe von Trotta about the work of Danish filmmaker Ingmar Bergman. Also on the program is the 1947 classic, The Third Man, the 1975 Australian film Sunday Too Far Away and the 1967 epic El Cid. Check out the full program here. Tickets to each screening are $17 for adults and $14 for concession, book here. The Canberra Home & Leisure Show is about all things in and outdoors. Its focus is on the home, 4WDing, cooking, camping and caravanning. Whether you’re building a new home or a local wine enthusiast, you’ll find something to please you in one of the show’s precincts. There will be a cooking stage, a kids zone, a caravans, camping and outdoors section, a home & renovations section, and a travel and lifestyle pavilion. Tickets are $14 for adults and $11 for concession, book here. Canberra’s annual celebration of Japanese culture is on this Saturday night at the Canberra Nara Candle Festival. In its 15th year, this festival celebrates the sister city relationship between Canberra and Japanese city, Nara. The relationship between the two cities itself has reached its silver jubilee this year, making the celebrations that much more memorable. There will be over 3000 shimmering candles, Japanese food, arts and crafts—calligraphy, lantern making, origami and ikebana—markets and stalls. The Canberra Zombie Walk is on again this Saturday. The undead will take over the city spreading their infection, celebrating Halloween and raising money for the Brain Foundation. 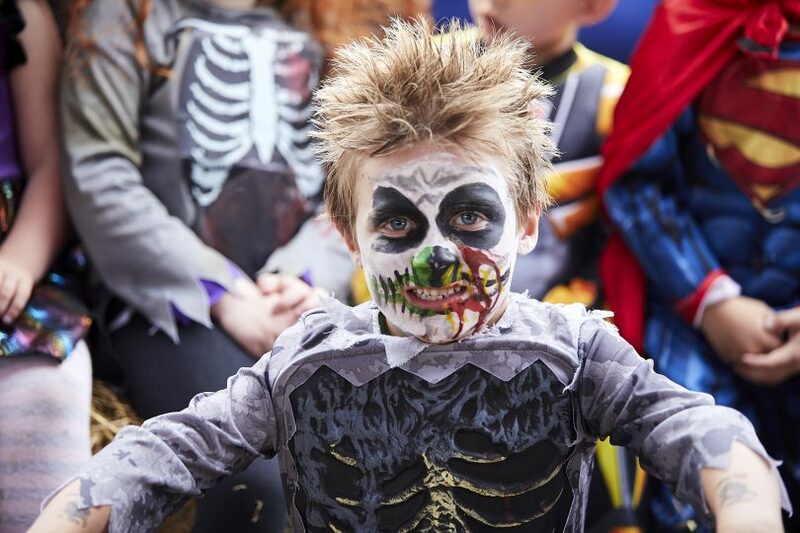 Turn yourself into a zombie, monster or ghoul and head to Glebe Park, or get made up at the park by the experts, then shuffle through the city with the hordes. There will be prizes supplied by Impact Comics and Dee’s Comics for the best-dressed kids and adults and for best acting. At the end of the walk, there will be monster mash with local bands and artists performing at Glebe Park and an after party for adults at Reload Bar. To enter the competitions and get perks at the after party you’ll need a ticket, book here. All money raised will go to the Brain Foundation. Head over the border this Saturday for one of the biggest Halloween street parties in Australia—Boogong. This year the event will be held on the Rockley Oval in Googong with a stage set up featuring circus performers including aerial divas, acrobats and jugglers from Warehouse Circus and Circaholics, stiltwalkers from Dance Circus and DJs Blue Angel and Dr Wiedemann on the decks. Explore the creepy graveyard with mysterious headstones rising from the mist, try the kissing booth, dress up in your frightful best for a chance to win a prize, watch your back around the hordes of ghosts, goblins and zombies, and make way for acrobats, jugglers, stiltwalkers and roving monsters. There will be more than 20 gourmet food vendors to feed the hungry hordes and the night ends with a bang when the fireworks go up at 9 pm. Michelangelo Antonioni’s 1970 film Zabriskie Point which examines American counterculture through the journey of two disaffected young adults who meet in the Californian desert. Screening at 10:15 am, book here. Tales of the American, a documentary film by Stephen Seemayer and Pamela Wilson which celebrates the free expression, cultural change and history of the development of Los Angeles. Screening at 12:30 pm, book here. Rober Altman’s 1973 neo-noir thriller, The Long Goodbye, which stars Elliott Gould as Philip Marlowe, a private detective thrust into the underbelly of Los Angeles. Screening at 2:45 pm, book here. It’s the ACT Emergency Services Open Day this Sunday. Learn about what the ACT Emergency Services do to keep the community safe, watch skills demonstrations, participate in hands-on activities and enjoy the food and entertainment. It promises to be a great day out for the whole family. Emergency Services workers are also keen to speak to you about what you can do to best prepare for the upcoming bushfire season. Be prepared.